This is the fifth post of our weeklong series, Into the Light: A Series on Abuse and the Church, which features the stories of abuse survivors, along with insights from professional counselors, legal experts, and church leaders about how to better prepare Christians to prevent and respond to abuse. (Previous posts include: The Scar of Sexual Abuse by Mary DeMuth; No More Silence: An Interview with Boz Tchividjian of G.R.A.C.E. ; “Today’s Journey”: Thoughts on Healing from Grace Biskie; and Proper Treatment for Sexual Abuse by Dr. Philip Monroe.) Through the course of the series, we will be discussing child abuse, spiritual abuse, sexual violence and abuse, and domestic violence. In addition, my friends Hannah, Joy, Shaney, and Elora will be hosting a synchroblog focused specifically on spiritual abuse, which you can learn more about here. This morning’s post comes to us from one of my favorite bloggers, Sarah Moon. Sarah is a Women's Studies student at Oakland University, an intern at Alternatives for Girls in Detroit, and a master burger-flipper. She enjoys studying feminist theory and theology, playing nerdy board games with her fiance Abraham, and blogging at SarahOverTheMoon.com. God is love. I believe that with my whole heart. But what is God? And what is love? We need to ask ourselves these questions and think deeply about them before we can even begin to start solving the problem of abuse in the Christian church. Growing up, I was taught that God was the source of all love, and that we could only know love by knowing God (I no longer believe this because I believe all human beings, theist or atheist, are capable of great love). As a straight-A student at a Baptist high school, a member of an award-winning Bible Quizzing team, and a substitute church pianist, I thought I knew God pretty well. When I met my first boyfriend, he treated me how I imagined that God might treat people. So when he told me he loved me, I believed him. That’s why he grabbed my arm so tightly that it left hand-print-shaped bruises after I tried to walk away from him after a fight. He “loved” me too much to let me walk away. That’s why he touched me in places where I had asked over and over again not to be touched. He “loved” me too much to keep his hands off of my body. That’s why, when I tried to leave him, he threatened to kill me and himself. He “loved” me too much to live without me, or to let me live without him. I thought it was love, but it was abuse. Somewhere along the line, I learned to accept abusive behaviors as truly loving. Part of this was undoubtedly due to the fact that we live in a culture and society that portrays abusive behaviors as protective, passionate, and romantic (think Beauty and the Beast or Twilight). As a society, we’re confused about love. According to bell hooks, we “cling to a notion of love that…makes abuse acceptable.” (from All About Love: New Visions). We don’t know much else because, as a society, we don’t have a clear definition of love. Abuse abounds and it calls itself love. Evil appearing as an angel of light. What has the church done about this? When I, as a confused, hurting 16 year old girl turned away from these poisonous definitions of love that were slowly killing me toward the God who was supposedly the source of true love, what did I find? I found that my church was eager to attribute horrific acts—from the genocides of the Bible to modern school shootings—to God and call them “loving.” In its theology, my church had twisted the meaning of love beyond all recognition because it thought that doing so would do God justice. I did not find a new, healthy definition of love from turning to God, because my church’s image of God was born out of the union of church and a culture of abuse and oppression. As we talk about abuse in the church, it is important to treat the symptoms. But we need to go deeper. If our God were a man, and the church were truly his bride, would He be an abuser? When we think about the ways that we say God interacts with the world, can we truly call those love? It’s hard to think about our images of God. They’re anchored deep in our theologies, in our hymns and worship songs, in our prayers and in our children’s coloring books. It’s easy to be afraid that the second we pull up those roots and examine them, the earth will fall out under our feet. But it’s important. In fact, it’s necessary. 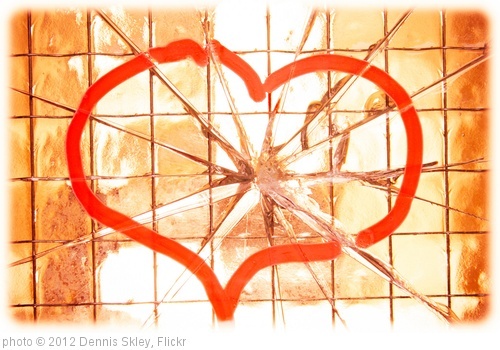 If we’re going to talk about abuse, we need to talk about the opposite of abuse—love. If we cannot decide on a clear definition of love, then abusers will continue to hide behind it. And if we, as Christians, are going to talk about love, we need to talk about God. Today, I believe that love is the opposite of abuse. I believe the words of bell hooks when she says, “love and abuse cannot coexist.” I repeat these words to myself everyday. When I embraced a new definition of love that could not include harm and abuse, and when I started to hold God to the same standards of love that I now hold all of my romantic partners to, the God I’d once known faded away. But new images of God soon came flooding in. God is the strength I found to leave my abuser. God is that whisper of hope that sometimes cuts through pain from abuse that persists even after six years. God is the protest song that fills my lungs as I continue to march toward freedom. God is justice, hope, and peace. God is the opposite of abuse, because God is love, and love is the opposite of abuse. Images that twist the meaning of love to paint God as a cruel and hateful abuser do not do God justice. As a Christian community, we need more images of God that affirm God as a God of love. We can drive out the darkness of abuse, but only with the light of love. Don’t forget to check out Sarah’s blog. If you are in an abusive situation, please seek help immediately. No act of abuse is justified by the Bible or desired by God. And don’t forget about the Spiritual Abuse Awareness Week synchroblog.